Microsoft CEO Steve Ballmer positioned Windows 7 as an operating system that can drive new and innovative products, as the company tries to fend off competition from tablet computers based on software from Google and Apple. “Only the imagination limits what can be done with Windows PCs today,” Ballmer said in his speech at the start of the Consumer Electronics Show in Las Vegas. “You can write on them, draw on them, hang them on the wall, touch them, use wireless keyboards, play a game and much, much more,” he said. 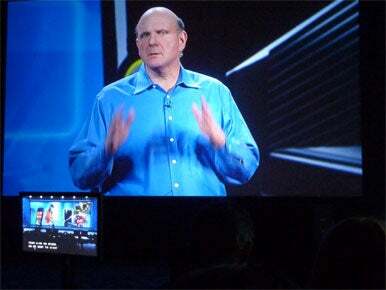 Microsoft CEO Steve Ballmer plugged Windows 7 as an OS for all devices at the CES show in Vegas Wednesday. Mike Angiulo, a Microsoft general manager, showed off several upcoming Windows 7 PCs with unusual designs. One of them, from Acer, had two large touch-screens connected together like a notebook. Touching all 10 fingers on the bottom screen turned that screen into a virtual keyboard for typing. He also showed a Samsung laptop with a screen that can slide closed over the top of the keyboard. When the device is closed the screen faces out so it can be used as a tablet. And he showed an Asus tablet PC that has a separate wireless keyboard and a particularly bright screen that he said is easy to view from almost any angle. All the PCs were running Windows 7 and will be available in the next few months, Ballmer said. “They’re on the leading edge of new devices that offer it all,” he said. Microsoft is facing new threats from Apple with its popular iPad and from tablets based on Google’s Android operating system. While Windows 7 is used on some tablets, those available have not captured the imagination like those from Microsoft’s rivals. Ballmer also told the audience how the next version of Windows, which has yet to be officially named, will be available for the Arm chip architecture. Historically, Windows has been based on the x86 architecture used by Intel and AMD. Arm chips typically allow for better battery life and are used in devices like mobile phones and tablets. Transitioning Windows to Arm will be a major undertaking, and to prove the work is already underway Angiulo showed some early Windows code running on stripped-down Arm-based hardware. He showed Windows running on a Qualcomm Snapdragon chip as well as a chip from Texas Instruments. “This is Windows running natively on Arm,” he said. Angiulo also showed off a new version of the Surface tabletop computer, which also runs Windows 7. It represents the next generation of Surface and is based on new technology. Instead of using cameras underneath the screen, the new Surface uses infrared sensors embedded in each pixel, he said. Essentially, it means that every pixel acts as a camera that can read documents and gestures. Samsung helped build the new Surface, which is now just four inches thick instead of a foot deep like the previous model. That means it can be wall mounted or used as a kiosk as well as a table-top. It is covered with strong Gorilla glass tough enough to withstand a beer bottle being dropped on it from 18 inches, he said. The Royal Bank of Canada will be one of the first companies to use the new Surface computers in its banks. Ballmer also announced a couple of new features and updates coming to Xbox and Windows Phone 7. This spring, which is typically the second quarter in the U.S., Microsoft will begin letting Xbox Live subscribers use Kinect to do things like play and stop Netflix movies using gestures instead of a controller. People who subscribe to Hulu Plus through Xbox Live will also be able control that service with hand gestures, he said. Kinect, which was launched before the holiday season, lets people control and play games using body movements rather than a controller. The technology behind Kinect will also be improving, Ballmer said. It will track more detailed movements like a smile and even the raising of eyebrows. That will allow a new application called Avatar Kinect. The app, which will be available to Xbox Live Gold members this spring, lets people sit in their living room and chat with friends in other locations, watching their avatars move on screen as they speak to each other. Microsoft now has 30 million Xbox Live members and a new member joins every two seconds, Ballmer said. He also said that the company has sold 8 million Kinect sensors. He called the recent holiday season the biggest ever for Xbox. Ballmer also talked up the launch of Windows Phone 7. There are now more than 5,500 apps available for users of the phones and more than half of Windows Phone 7 users download a new app every day, he said. Over the next few months Microsoft will push out a series of updates to users of the phones. The first will offer them the ability to cut and paste text, an omission that many people criticized Microsoft for leaving out of the initial phones. Other updates will include performance improvements when loading and switching between apps, Ballmer said.